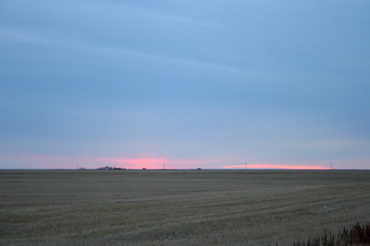 The sun was setting as I drove away from Weyburn late this afternoon. I was there attending my friend D's funeral. She was my age and had two children, the oldest one just a few months younger than my oldest. She passed away one year, one month, and four days after being diagnosed with cancer. I had not seen her for six years. So I've been thinking... if there's something important that you (I) want to do or say, then you (I) should do it now, not later. It's not a cliché. The bright spot of my day was having a good visit with my parents over supper this evening. Thanks Mom and Dad.